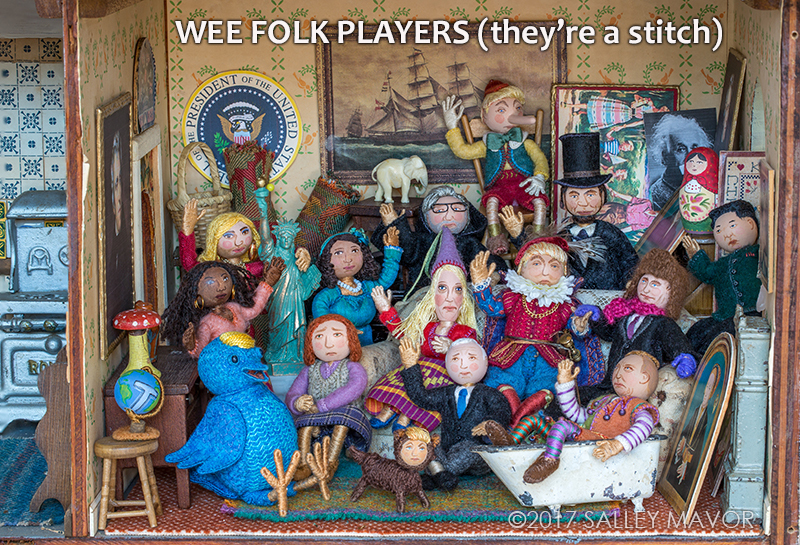 The Wee Folk Players (they’re a stitch) formed soon after the 2016 election and have been performing political satire on this blog ever since. For some insight into Salley Mavor’s foray into current affairs, please watch this Interview on WGBH TV. Episodes in the American Drama Series are listed below. Cast and crew from the Wee Folk Players help position actors and move props backstage. Click on titles to see individual posts with photos, videos and corresponding commentary. For the complete Wee Folk Players archive click here. DECEMBER 2016: Flat Earth Society, The internet today, 5 Stages of Post-Election Grief, It’s going to be SO beautiful! 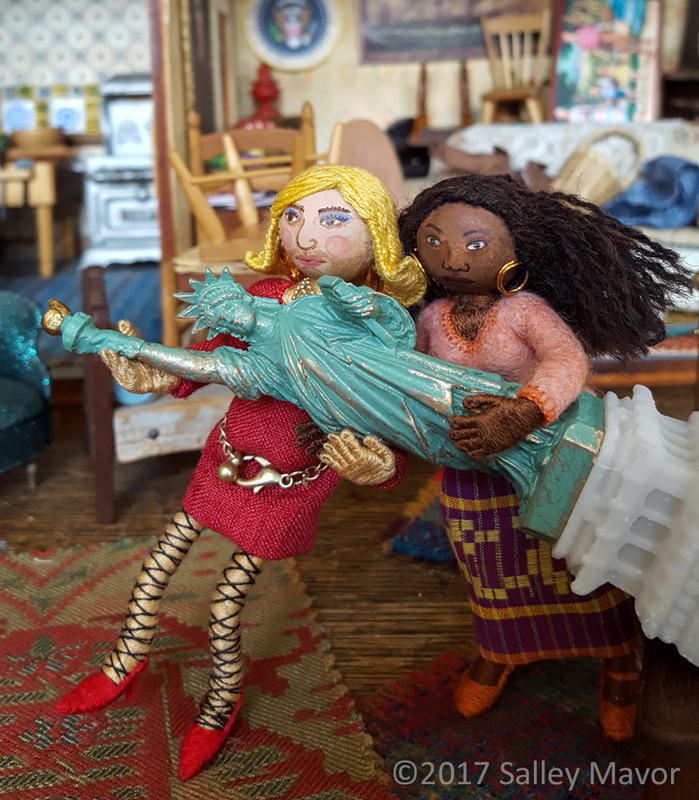 MARCH 2017: Little Red, White and Blue, Tap Dance, Wonderland ex-Press, Artificial Intelligence, Nightmare on Pennsylvania Ave.
MAY 2018: The Players’ latest project is the 13 minute stop-motion animation, LIBERTY and JUSTICE: A Cautionary Tale in the Land of the Free. What happens when a pair of lost citizens wander in the deep dark woods in search of a new leader? In this satirical take-off of the traditional folk tale, “Hansel and Gretel”, the wordless story follows protagonists Liberty and Justice as they negotiate the challenges of today’s unique political landscape, while being shadowed by a persistent Twitter bird. Watch and share the 13 min. movie on YouTube here. It’s going to be SO beautiful! To keep up with new posts, subscribe to this blog (top right column on the home page). And for a wide-ranging look at new and old material from Wee Folk Studio, please follow along on Instagram and Facebook.